“It’s probably no surprise that Arlington, home to the national cemetery and major military memorials, is the top town for stripes”, says Fraser. 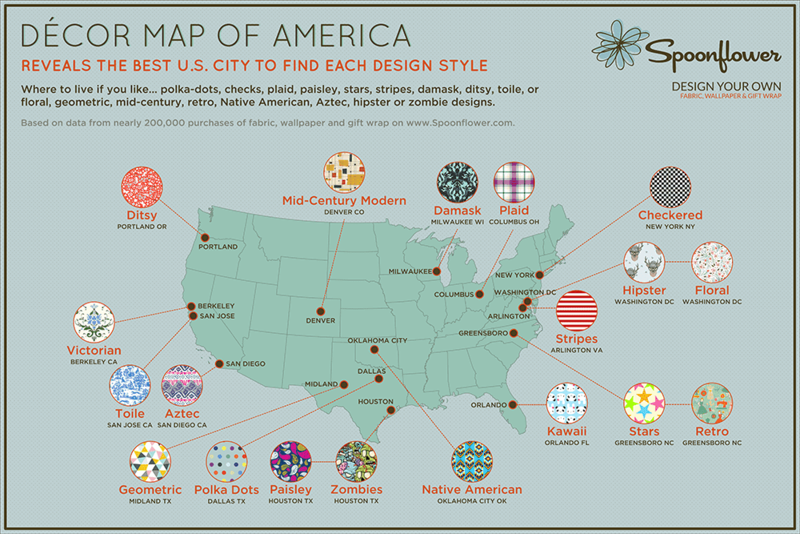 It likewise makes sense that San Diego, on the doorstep of Mexico, ranks top for Aztec designs, while Native American décor is most popular in Oklahoma City, capital of a state where some 40 Native American tribes have their headquarters. 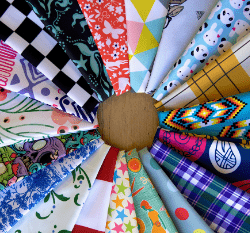 Houston too seems a fitting capital of paisley – as in the paisley kerchiefs long the neckwear of choice for the well-dressed cowboy. The university town of Berkeley, California was famed half a century ago as the capital of hippiedom but turns out nowadays to be the U.S. capital of Victorian décor. This may be because rising house prices have attracted a more upscale and – whisper – conservative crowd. But it may also be due to the many Victorian homes in town and a simple desire for décor in keeping. 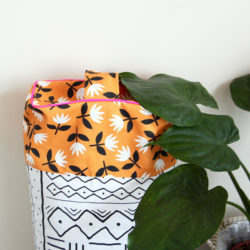 Portland is Spoonflower’s capital of ditsy designs, which, like the good folks of Portland, express the belief that small is beautiful. Denver, the city where Midwestern cheer meets Californian chill, is the top town for mid-century modern. Orlando, home of Disney World, makes an appropriate capital of kawaii, the Japanese style of cutesy cartoons, which might be considered Japan’s answer to Disney. But who knew that Washington DC, the nation’s capital, would also turn out to be its capital of hipsters; or, at least, the city where décor with hipster motifs would sell best? Yet it does by some margin, leaving the likes of Austin, Seattle and San Francisco in its trail, while Brooklyn, historic center of the hipster universe, trails all of them. “It seems likely that hipsters in Brooklyn are simply too hip to buy décor labeled as hipster,” observes Fraser. Washington, however, also ranks top for floral designs – making it a town divided between hipster shades and floral drapes. It is also one of just three cities to top the national rankings in two different categories. The others are Greensboro, North Carolina, top for both stars and for retro designs, and Houston, the top town for both paisley and zombie décor. 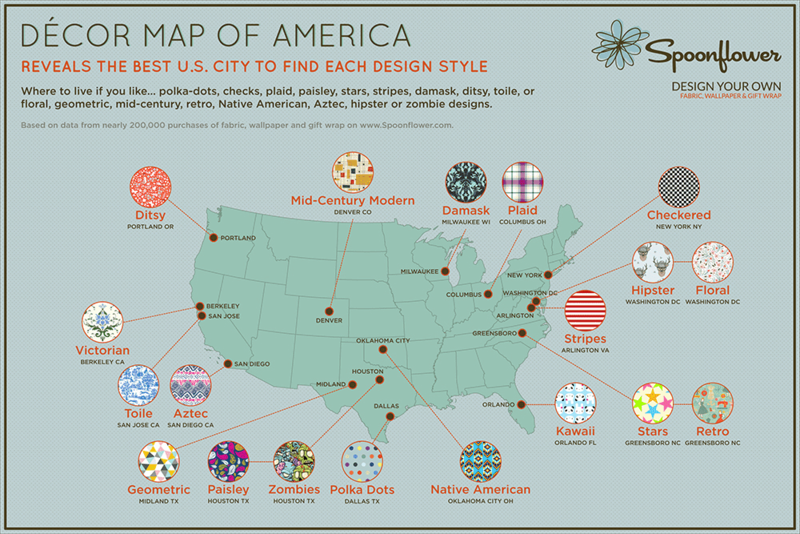 “Hipster” and “zombie” are not traditional décor styles in the same sense as, say, damask, paisley or plaid, but they qualify for Spoonflower’s map as niche décor categories which are scarcely available elsewhere. 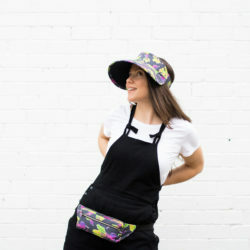 Spoonflower is, for example, the world’s leading source of zombie fabric and wallpaper designs, with over 400 unique examples on offer. Want more? Find out the Hipster Capital of the United States. 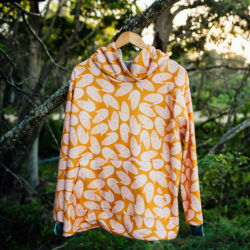 Sitting here in Dallas……wearing a polka dot sweater. ??? ?